The Keurig has been on the Coffee Whisperer’s test bench for about two months now. I’m impressed. Does it make the absolute best cup of coffee that I’ve ever had? No. But it does create a perfectly drinkable cup with the lowest effort of any coffee system, including instants. How does the K system make this happen? How does it turn ground coffee into brew in under a minute? It does this by blending together two traditional ways of making cafe: It is part drip, part espresso. A glimpse inside a K cup will illustrate this. This cutaway view will show you what you’d see if you tore a used K cup apart … there’s a paper filter bonded to the top of the cup. The cup holster assembly punches a hole in the top foil and pops a smaller passageway in the bottom. The 192 degree hot water is pushed through the top hole under pressure and moved through the grounds. 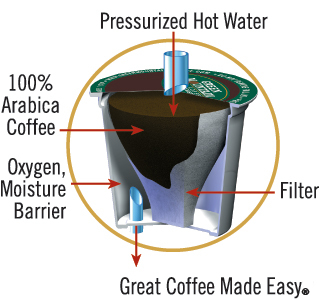 While not extremely high pressure, it IS greater than standard drip coffee makers that rely on gravity to pull the hot water down through the coffee and filter medium. This pressurized process allows the 8- 10 ounces of water to move through the device in under a minute, extracting the flavors of the final product. So while there are qualities of a drip system in place, the water mimics the characteristics of a pressurized espresso system. The difference comes into play when it’s time to clear the spent grounds. A espresso machine will require a swift rap on a knock box or trash bin to release the coffee “puck” and then a rinse under running water to clean the portafilter. Then there’s some brushing to clean the metal screen that distributes water from the group head. The Keurig requires a lift of the handle and cup removal. We’ll talk later about the need or wisdom of running an empty shot through the machine as part of regular maintenance. But here’s the real magic of the Keurig: it’s EASY. It’s easy to use, and easy to clean. No brainer, grab a cup and you’ve got it … coffee maker. That is indeed the attraction of this system, you can’t make a fresh cup any easier. Are there some downsides? Any compromises? Yes, sure. But you get a solid cup without a bunch of hassle. Actually no hassle. And that’s how a Keurig works. Basically. There’s buttons and features and stuff. But if you’re interested in how the coffee comes out….well, there you are. This entry was posted in Brewing Coffee and tagged coffee, drip, filters, Keurig. Bookmark the permalink. If I have to run the cycle a second time to FILL a cup, does it benefit from taking the K-cup out and taping it on the side of the sink to redistribute the grounds in the K-cup so when the machine goes through a 2nd cycle, the water doesn’t go through the SAME path that the first cycle did. Reason, if I don’t shakeup the K-cup on the 2nd go-round, the water coming into the coffee cup seems lighter, almost like it’s not getting the benefit of the grounds, like it’s going through a channel made by the first cup/cycle. I’m not trying to get a 2nd cup out of the K-cup, but trying to fill my cup to the top and none of the button settings do that with a 1 button cycle. Chris: If you haven’t figured it out by now, yes, shake that bad boy! I find it works for a second cup as well (I really am that cheap!). I have the Vue system, which allows you to choose “strong” as opposed to “regular” brew, so a shake, “strong,” and maybe an 8 oz instead of a 10 oz (my usual), and there’s a pretty decent brew coming forth. I’m not really getting the cup size choice on my Keurig Elite. There are 3 cup sizes to choose from so my question is, if I pick the larger cup(mug) size, does that mean because there’s more water going in the coffee will be weaker? Carol, the larger cup size does mean that more water is being forced through the grounds in the Keurig cup. So it stands to reason that the larger cup size will yield weaker brew. You don’t specify in your post, are you using a do-it-yourself K-cup? I’ve found that some store bought drip coffees are ground too fine for the Keurig system to pass through. Try some coffee with a slightly coarse grind and you may solve your problem. 1 yr old Keurig. I’ve turned on the machine, waited for it to say “Ready for brewing”, insert the K-cup, close the top, press for a full cup (right hand button) and get about 1/3 of a cup. The heating process after selecting a full cup seems to be taking longer – a little over a minute. If I wait for that to end, lift the top, turn the machine off, then back on, close the top again, and select full cup, I can get about 3/4 of a cup – a little less than when new. I have cleaned all the needles. That seems to be either a weak/damaged pump or the needles are not puncturing the cup all the way through. I have had the experience of certain brands of cup not fully puncturing or puncturing so little that the resulting hole was very small and the motor seemed very labored and nearly no coffee came out. I would look at the holes made in the bottom and top of the cup. They should be completely round and cut through. If the surrounding plastic has dimpled over and the hole seems tiny/partial, then you might have a cup that’s buckling when the top is closed. Failing that, try simply running they Keurig with no K-cup a few times. There could be coffee lodged INSIDE the needle that needs to be flushed out. If indeed you have a failing pump, that would require professional service. I would believe that sort of failure is quite rare. Good luck. When does the water get heated for a cup of coffee? I am surprised a lot of the times when I go to brew a cup of coffee and the fill water light comes on as I hit make my cup size selection. So does it warm it up normally after that point or prior? If prior, why wouldn’t it know it needed water? Tied to the last question, the reason for it, when I turn on the machine, it says it is heating. If it isn’t heating the water, what is getting heated? My morning brew is usually *Bold* and Very Sparkly *aromatic*, but this can be adjust by increasing water intake the night before. A different perspective on things? Yes…but a necessary one no less. Does the weight of the cup matter. Paper doesn’t seem to work? I went to this site out of curiosity, since Kuerigs seem to be showing up everywhere. I’ve been running a Rancilio Sylvia espresso machine for about 10 years now, accompanied by one of the large Kitchenaid coffee mills because coffee starts to lose its zap the instant you grind it. These two machines have performed flawlessly, and I can put out a superb espresso or Americano in less time than it apparently takes the Kuerig to cycle. Further, I don’t have to add all those little paper filters to my trash bin … and I can, if I wish to spend the time, make a superb latte. Beyond my having probably paid more for my setup than a Kuerig would cost, I’d argue that it’ll outlast several Kuerigs because it’s robust and because it’s easy to repair and obtain replacement parts. In a nutshell, I can’t understand the appeal of the Kuerig units. Cost might be a factor, but then I’ve always been enough of a coffee freak to be willing to shell out bucks for the best I can get. I have found that some brands of K-cups are more prone to plug up the injector than others. I had begun having serious problems getting a full cup. sometimes a partial and sometimes nothing. I was having to get out my paper clip every third cup or so. Then I ran out of my regular brand and had to buy a substitute. At first, I was ticked. Then I went through a whole box of K -cups without a single failure. I have gone through some more testing and now have a new favorite that gives me the taste I want and rarely plugs up. The 250 model, while limited, will give 16oz with a “fill-it cup. Select 2 and then select 16 oz Strong. Fill the cup to recommended max (green tab) before inserting. Don’t know if you are still taking questions..but, here goes: Using a Kuerig 2.0. On several occasions, while brewing dunkin donut K cup pods, we have experienced the grounds and hot water exploding out of the machine. Interestingly, the top of the pod appears exploded in, not out. Have cleaned the machine several times. any thoughts? suggestions? That sounds like a poorly manufactured cup or a cup that isn’t getting properly opened at the bottom. The exploded in thing may be from the top foil being pulled and stretched because the hot, pressurized water can’t escape downward from the bottom of the cup and it backs up the opening at the top. Once you open the machine the foil loses pressure and sags. Try another brand to see if it happens. If it does, the issue may be with the bottom needle being bent or broken. If it stops, you’ll have to perhaps switch to a reusable cup to get your Dunkin Donuts fix! my kureg keeps letting coffee grounds into coffee. sometimes a large hole can be seen in bottom of pod ? Are the cups new and are still leaving grounds in your coffee? Are they all from the same brand of coffee? They shouldn’t leak, perhaps there’s a manufacturer’s failure. Try another major brand and see if the problem continues.